Exercises are a fad for many people who are in their twenties and thirties. However, once you are in the wrong side of fifty, integrating exercises in your daily regimen can be worrisome. Fortunately, there are some forms of exercises which do not entail rigorous training. Besides keeping the seniors physically fit, these exercises enhance the emotional well-being as well. Yoga is the ancient Indian practice for relieving stress as well as alleviating muscle pains and aches. Yoga is a full body workout which stresses on deep breathing along with specific postures which needs to be maintained for a period of time. It’s also a great exercise for improving the overall flexibility and cardiovascular activity of seniors. Pilates is the exercise which strengthens the core muscles or the abdomen and back muscles of your body. Core muscles are crucial for full body training and general fitness, since strong core muscles help stabilizing your body. Pilates helps seniors tremendously since the core muscle strengthening exercise of Pilates improve lower back health and urinary control. Swimming is considered as the best full body workout by many. Swimming doesn’t only engage the core muscles of one’s body; it’s extremely rejuvenating as well. Especially for seniors, swimming is recommended since it’s a low impact exercise option. Hence it’s ideal for people with chronic back problems or joint pains. Yet another low impact exercise for seniors is biking. Biking is regarded as one of the best exercise for one’s glutes and legs. If one requires mobilizing the core muscles, biking in rough terrains is a good option. All in all, biking is one of the most practical exercises for seniors. Visiting a local bike shop and customizing the bike for proper seating and leg extension is however advised. Seniors might shrug off power lifting as an exercise for the young, but power lifting can help seniors maintain muscle mass, which otherwise gets depleted with age. 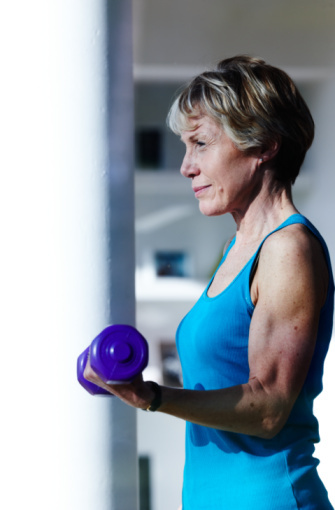 Increasing muscle mass in the later years can extend one’s longevity as well. However, having a personal trainer during power lifting routines is of vital importance. Rowing is an exercise which has long been regarded as an upper body strengthening exercise. However, rowing can be a remarkable exercise for the lower body too. Rowing or even kayaking, can offer seniors an awesome kind of recreation which can serve a dual purpose of unwinding and toning up the core muscles of the body. Almost every physician recommends walking to seniors who seek health advice. Walking or hiking serves as a moderate exercise which helps seniors to shake off the sedentary lifestyle and simultaneously, improve general fitness and health. Circuit training and weight training, if done moderately, can be a very effective exercise regimen for seniors. It’s essential that one follows a circuit weight training programme which well-designed and well-rounded. On the whole, circuit weight training assists seniors in maintaining full muscle integrity. Tai Chi is an ancient internal martial art developed in China which is becoming increasingly popular, especially for the elderly. However, Tai Chi can transform and challenge even the young. Tai Chi incorporates subtle and continuous body movements with balance and coordination. Apart from having a calming effect on your mind, Tai Chi can increase the core strength of muscles. The final exercise which is included might surprise some, but ‘play’ can be so enjoyable, that one might forgo pursuing any other form of exercise. Seniors simply require recommitting themselves to one of their favorite hobbies; be it skiing, dancing, golfing or tennis. After all, the objective of exercises is improving the physical and emotional health of a person, and there’s hardly any other form of exercise which motivates seniors and rekindles their passion as much as a favorite sporting activity does.